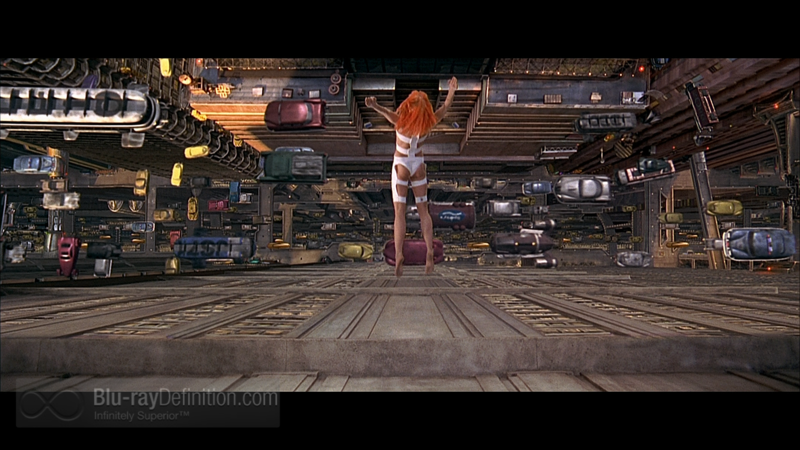 We are living in an era when smart network Blu-ray disc/media players seem to be swarming like 17-year cicadas. So how does a new device make its mark in these crowded skies and get you to sit up and take notice? Well, for one thing, being small and staying out of the way might be a nice start, and here comes the Toshiba BDX6400, a mighty mite that packs a lot of nice features. Toshiba has been in the 3D playback market for several years and now tries to future-proof its hardware line with a device that will communicate with the next-gen video format—4K or in the street vernacular “Ultra HD” resolution. 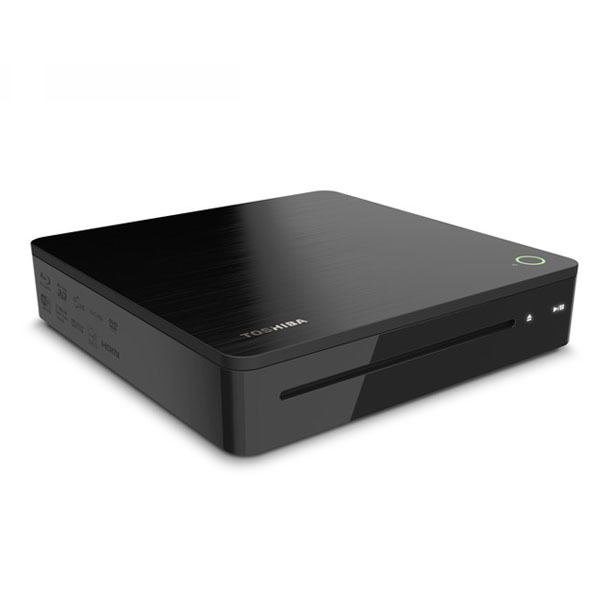 The BDX6400 is the top-of-the-line player in the Symbio™ player/media series. 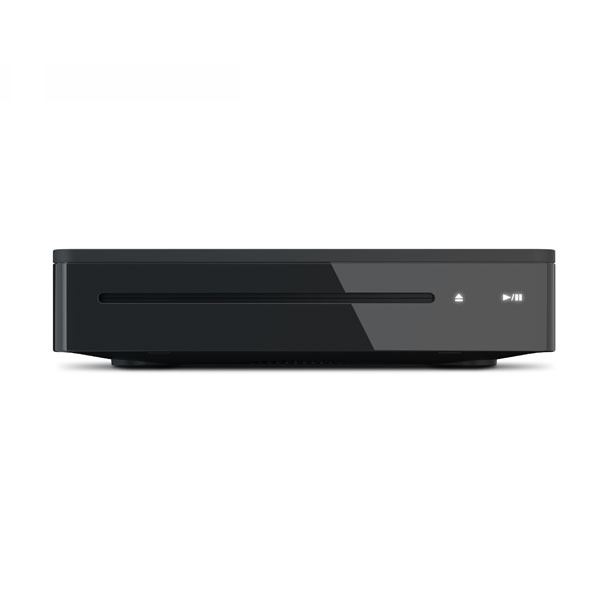 While billed as a Blu-ray player (and it will play standard and 3D discs), the BDX 6400 will also play DVD-ROM, DVD-RW, DVD-R, standard CD, CD-RW, and CD-R as well as other audio/video formats (see Specifications). The first and one of the few set up decisions that you must make is whether you want the BDX6400 standing straight up (with an enclosed mini-platform that can be attached to its base) or whether you want it to rest on its little rubber feet. Otherwise, in spite of the rather Spartan fold up “Quick Start” menu, the next few steps involve connecting the power supply “wall wart,” an HDMI cable (and/or SPDIF output for digital audio), an Ethernet cable (for hardwired network connections), and a USB jack, for outboard drives with audio, video or photo files. For those needing more thorough instructions, a full user’s guide is available on the Toshiba website (www.toshiba.com). 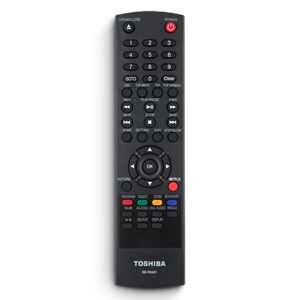 As remote controls go, the Toshiba SE R0439 is pretty basic. Topped by eject and power buttons, an alphanumeric keyboard, a row of buttons for on-screen display, top, pop up menus, and PIP menus, are the usual disc player controls. A row of buttons for “home,” “setting,” “exit,” and “step/slow” sits above a function dial for on-screen menu selections. 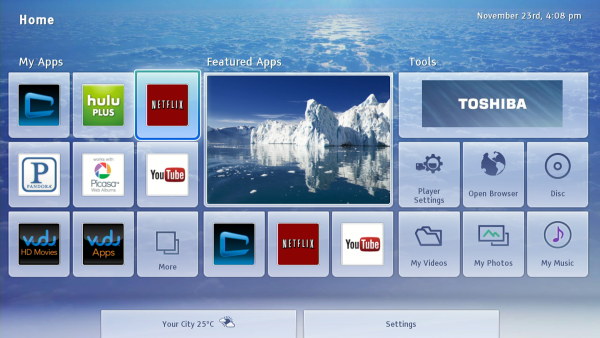 Of the remaining function buttons, the most eye-catching is the red button for direct Netflix access. Since there is no front panel display (or function buttons other than play/pause and eject) on the BDX6400, use of this unit is absolutely dependent on the remote control. Here, I ran into some minor glitches. Navigating the home screen from icon to icon was not as smooth as I would have liked and transition between screens had delays ranging from five to ten seconds. I also noted that off-axis communication with the front panel IR (while specified to as much as 30o) was a bit finicky if the remote aimed was off-center (either sideways or heightwise). As has been the case with a number of new devices that I have evaluated, I had to upgrade the firmware before I could get network access established but, once done, the BDX6400 worked flawlessly in both wireless and wired modes. There is a relatively straightforward screen set up menu that begins with the Set Up Wizard. You can adjust for display type, digital audio output, and internet connection. Additional features like WiFi-Direct and Miracast (for video streaming) require compatible devices (that I did not have) but will surely please viewers who already own them. The Toshiba BDX6400 features a collection of smart apps including Netflix, Vudu, Hulu, Pandora, Picasa, YouTube with the promise of more to come on the “ePortal.” Before going any further, the disclaimer is that, like most current viewers, I am not yet 3D- or Ultra-HD capable so my major assessment of this player is how well it works for Blu-ray discs and network media. First and foremost, let’s examine the Blu-ray playback. The BDX6400 adequately passed the basic test videos on the HQV 2.0 Blu-ray evaluation disc. As regards loading times, the BDX6400 was about as speedy as my reference Oppo BDP-105. 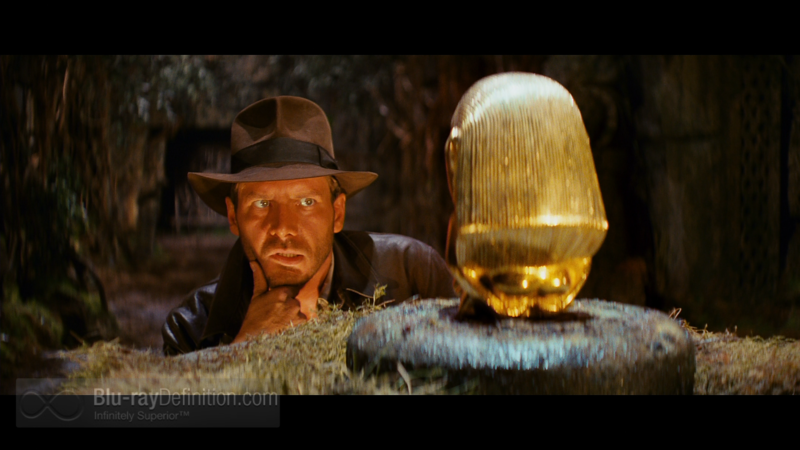 I then fed it some recent additions to my library, including the brilliantly remastered Raiders of the Lost Ark, a stunning restoration of Lawrence of Arabia, and my old reliable, The Fifth Element. 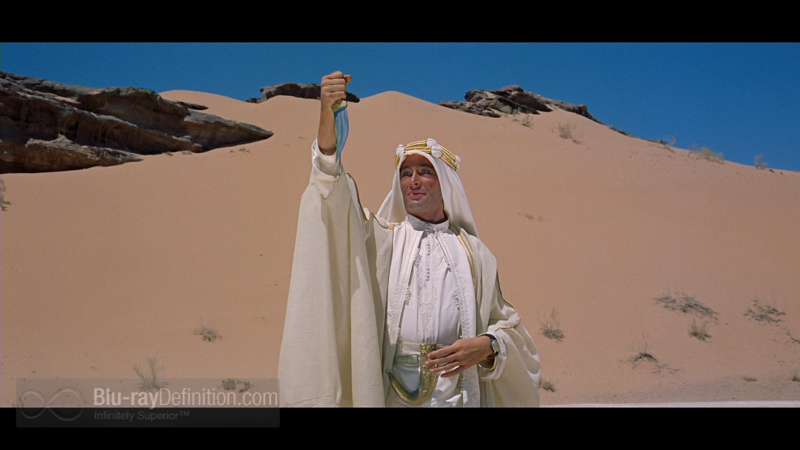 As the screenshots (below) demonstrate, images were certainly quite crisp and very close to what I saw on my reference Blu-ray player. 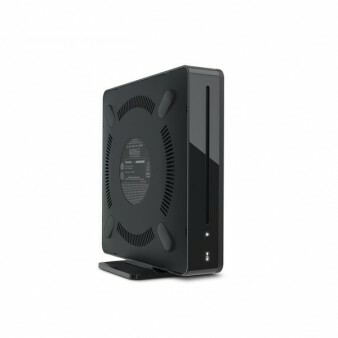 After investigating a few of the “premium” online sites including Netflix, VUDU, and Hulu, I could not distinguish the images and sounds produced through the BDX6400 from those displayed by my Oppo player or Boxee Box. The BDX6400 will not play all the high-resolution media, i.e., download files or SACDs. How much of an issue this becomes will depend on your current or planned future digital music library. I fed the player a passel of CDs, including Reference Recording’s new release of Elgar’s Enigma Variations and Vaughn Williams’s The Wasps and Greensleeves. Everything that I heard was an effective presentation of the soundstage and dynamics of some pretty powerful orchestral pieces. Not really a match for my Oppo BDP-105, but the BDX6400 was not embarrassed by any of the standard resolution material that it received. 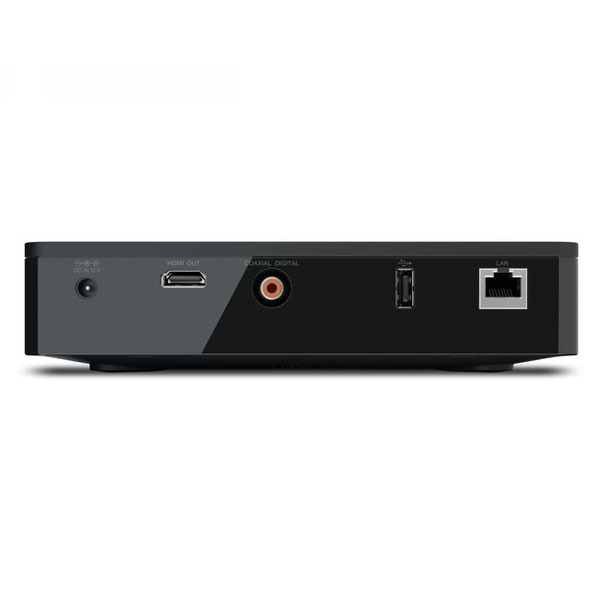 Okay, you have got this little black box that upscales to Ultra HD, plays 3D Blu-ray discs and some standard resolution audio discs and files, and has an array of smart apps. Should you run out and get it in time for the holidays? Well, maybe. The upscaling feature is nice to have but there are not many 4K displays currently in home theaters and probably will not be until the sticker prices for the large screens are substantially reduced (Ultra HD does not offer much visual advantage until you exceed the diagonal sizes of 55-60 inches). Streaming 1080p via Wi-Fi Direct is also a nice feature but you have to have compatible devices (of course one could say the same about Apple’s AirPlay). While Toshiba’s website is offering the BDX6400 for $50.00 less than its suggested retail price, this is unit is still a tad pricey for the features that it offers and there are a bunch of more conventional Blu-ray players that offer the same special features at lower cost. I would consider the BDX6400 player/media device’s small footprint as its main selling point. Being not much bigger than an iPad, it can sit on a desktop or small-shelf unit in a cramped apartment or college dorm room and, that is where I would think it would most likely reside.